This week, #SundaySupper is sharing Asian recipes! Our hostess is Amy from kimchi MOM, and she asked us to share our favorite Asian-inspired recipes. While Asian food is one of my favorite cuisines, I have to admit that I don't make it at home that much since my attempts don't always taste truly authentic to me. For this week, I decided to make an at-home version of one of my favorite Asian appetizers: crab rangoon wontons! My Shrimp Rangoon Egg Rolls with Honey-Soy Dipping Sauce have all the creamy goodness of the addictive wontons, with a few added surprises! To the usual rangoon base of cream cheese and green onions, I added some fun extra ingredients. Chopped water chestnuts provide crunch, Korean Gochujang chile sauce (similar to sriracha) brings some heat, soy sauce, lemon zest, and large chunks of shrimp. These egg rolls fry up crispy outside and creamy inside, and the dipping sauce is so flavorful! It's a little bit salty, a little bit tart...with a touch of spice and honey. These appetizers would definitely be a fun addition to your next party...or just because! 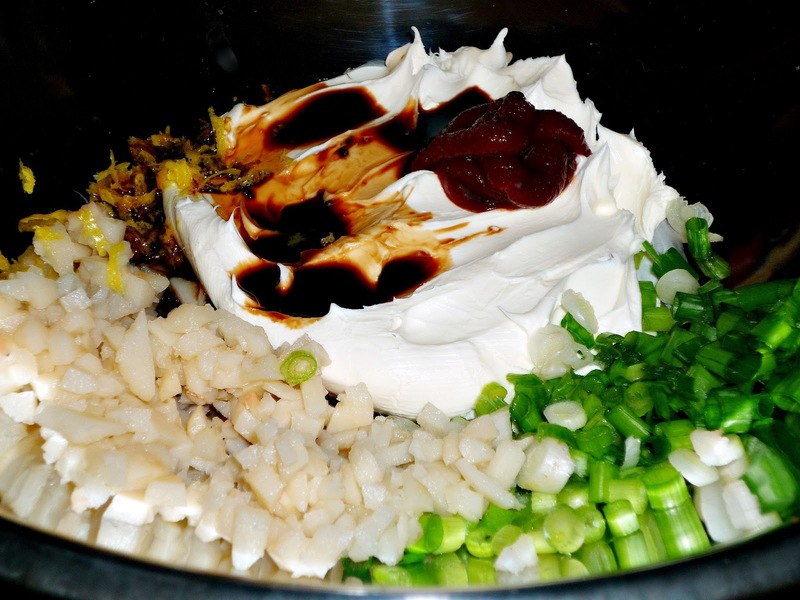 Step 1: Add the softened cream cheese, green onions, water chestnuts, lemon zest, soy sauce, and Gochujang to a large mixing bowl. Stir well until the filling ingredients are completely combined. Step 2: Assemble the egg rolls. Place a wrapper on a cutting board and moisten the edge with water. I use a cookie scoop to add a portion of the filling at one end of the wrapper. Spread the filling out a bit and add four pieces of shrimp. Fold the sides of the wrapper over the filling and shrimp, then roll tightly. Finally, seal the egg rolls with more water so they don't burst when you fry them. Step 3: Make the sauce by adding the soy sauce, ponzu, honey, Gochujang, oil, and vinegar to a small measuring cup. Whisk until completely combined and pour into a small bowl. Add the green onions and stir; set aside. Add the oil to a deep pot and heat over med-high heat, until very hot -- about 10 minutes. Fry the egg rolls, turning occasionally, until golden brown. Drain well on paper towels and arrange on a serving platter, along with the dipping sauce. 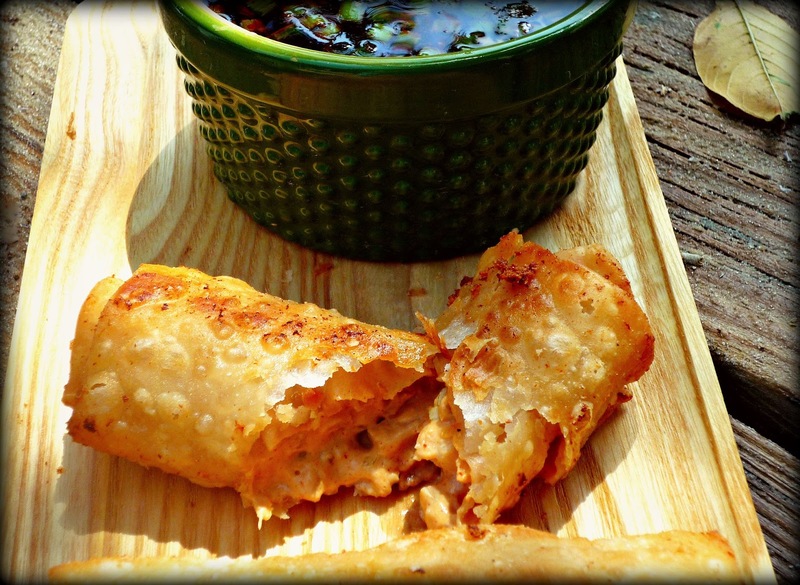 These egg rolls are so fun! The outside is perfectly crispy, and the inside is creamy good. The Gochujang provides a nice spice, the water chestnuts provide crunch...and the large chunks are sweet and flavorful. The dipping sauce is a little salty and tart...and a little bit sweet and spicy. 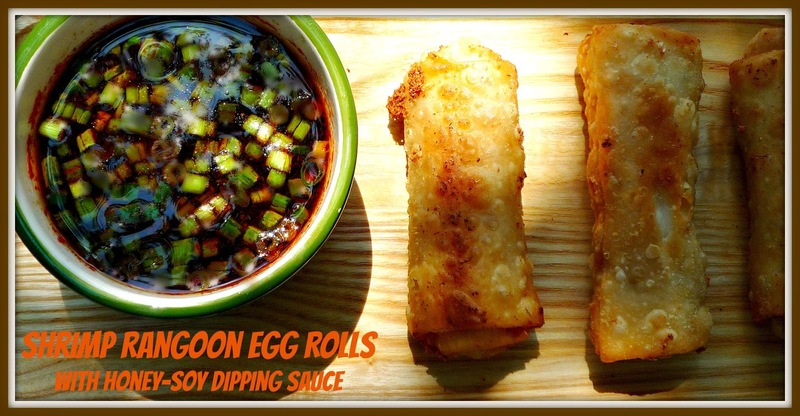 It works really nice with these egg rolls. If you've never tried ponzu, definitely give it a try -- it's a citrusy soy sauce that works really well with the lemon zest in the egg rolls. Wait until you see the wide variety of Asian dishes that this week's #SundaySupper participants are sharing! We've got everything from appetizers to soup...and entrees to cocktails. Be sure to click the links below to check them out.